Bergholz leader Sam Mullet is hoping to be granted freedom this coming Monday, March 2. That’s the date set for resentencing following the overturning of hate crimes convictions in August. The prospect no doubt concerns Amish in Ohio and elsewhere fearful of repeats of the beard-cutting attacks of 2011 (or worse). 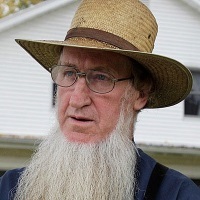 Mullet’s attorney says that “Mullet’s only wish is to return to a peaceful Amish community and put this ordeal behind him.” However, critics might note that the 69-year-old leader has a history of not doing what he says, such as in his promise to prevent future attacks only for another to occur. Perhaps prison time has worked a change in Mullet’s heart. Though due to his track record, I wouldn’t blame any Amish people for taking anything Mullet claims with an enormous grain of salt. Others imprisoned will be resentenced as well. Those given one-year terms (6 individuals, including 5 women) have already been released, as have those with two-year terms (2 individuals). Others were incarcerated for five years (3 individuals) and seven years (a total of 4, among them the 2 ministers, including Mullet’s son Johnny), with the longest term of 15 years being served by Mullet. In an email to attorneys, U.S. District Judge Dan Polster has said that he will likely permit the 8 already released to remain free (to be sentenced to “time served”), but has not given any indication about the 8 remaining in prison. No doubt Amish in Ohio and many other communities will be greatly anticipating Monday’s news. What next for Bergholz? And what about forgiveness? There is of course the question of what will happen to members of the Bergholz community. In the final chapter and epilogue to Renegade Amish, Donald Kraybill speculates about possible outcomes, and also raises the question of forgiveness. He also describes how some have left the community, while progressive change has crept in with leadership absent. Another question that has arisen throughout this case is addressed in the book, and remains relevant for their future: Is the Bergholz group a cult? Interestingly, Kraybill describes them as “not a full-blown cult” but as “a clan with some cultlike features” (p. 143). 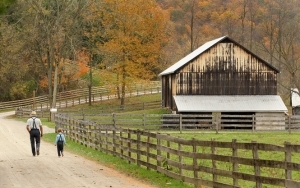 He lists 25 deviations from Amish norms, including “Terminating Sunday worship services”, “Accepting sexual misconduct”, “Censoring some incoming and outgoing mail”, “Condoning physical punishment to discipline adults (paddling)” and “Using the Old Testament as a primary source of authority” (see p. 139 for full list). So it’s unsurprising when one Amishman quoted says that “These people are totally not Amish” while an Amish scholar states that “They removed themselves from the Amish world when they stopped having church services.” (p. 138-139). Ultimately the impression I got after reading Kraybill’s book is that of an off-the-rails community in the control of a powerful, influential leader assured of his own righteousness. Combined with an unrepentant heart and a desire for revenge, there could be danger ahead if Mullet is released. On a more positive note, despite the fact that they have been essentially disowned by many of their former co-religionists, members of the Bergholz community and even Sam Mullet himself could find a way back into the Amish fold. To their credit, Amish would offer forgiveness. One ex-member of Bergholz quoted in Renegade Amish says that “Even today the Fredericktown people and related congregations, even today, they would forgive Sam and accept him back if he was contrite, and confessed, and returned to them” (p. 149). Likewise, a minister at Fredericktown, a community where Mullet once lived, said “Yes, we’d gladly take him back into the church if he repented and confessed” (p. 149). But with all we’ve seen in this case, that’s a big “if”. The whole Bergholz affair would be a sad chapter in the life of any close-knit community and any religious group, but I would think doubly so for the Amish, who so prize nonviolence. Human nature being what it is, I would be surprised if Sam Mullet repents his sins and surrenders the role he’d held of so much power. However, that power comes from the willingness of people to follow him; perhaps in his absence, his former followers have come to their senses. One would hope so. One interesting section in Renegade Amish describes Mullet’s self-depiction as a “martyr” in prison, and Kraybill suggest that this “may provide emotional energy to sustain the community for some time” (p. 155). If community members feel they have been wronged by the justice system (there is some evidence from members’ comments that is the case), it may only help an us-against-them spirit to persist even in the leaders’ absence. You may be right, Erik. I fear this may turn out to be the case. A very sad chapter indeed! I agree with the us-against-them spirit. In my experiences with many Amish and former-Amish (Swartzentruber and Old Order), I’ve experienced their militant stubbornness on particular issues. Living in Ohio, I know how this man and his followers have terrorized women and men of Amish. And I predict this group – once rejoined – will continue in their stubborn thinking and behaviors. The truly sad outcome is that his followers are religiously abused. He (as do many Amish) make Heaven or hell the result of his earthly manipulation. On August 27, 2014, three appellate court judges in a 2-1 decision overturned the hate crime convictions due to an error in the jury instructions. The other convictions (conspiracy, perjury and obstructing justice) remained intact. Surprisingly the appellate court did not address the constitutionality issues of Shepard-Byrd. On October 10, 2014, the prosecution petitioned the Sixth Circuit US appellate court in Cincinnati for (en banc), asking all of its judges to review the case. The legal decisions ensuing from this reversal will establish a judicial standard for how the Shepard-Byrd Hate Crimes Prevention Act is interpreted in the future for all hate crimes sparked by a victim’s gender, sexual orientation, disability, race, ethnicity, or religion. If the appellate court’s restrictive interpretation remains unchallenged, future hate crime prosecutions will require evidence of a predominant motive for attacks that cause bodily injury. The 6th Circuit Court declined to have all of its judges review the reversal. So on December 10, 2014 the federal judge in the US district court in Cleveland scheduled a resentencing date for February 24, 2015 [moved to March 2] for those convicted in the Amish beard- and hair-cutting case. New sentences are required for all of the sixteen defendants because the original sentences were based on the hate-crimes convictions. In addition to hate crimes all the defendants were convicted of conspiracy. Sam Mullet Sr., leader of the Bergholz Amish community, was also convicted of obstruction of justice and making a false statement. Eight of the defendants are out of prison. Is it just coincidence that “March Madness” is almost upon us? There are many warnings in the Old and New Testaments to beware of a false profit. History speaks for itself that people were fooled and followed, and the trouble that came upon them for their decision. Sam Mullet is one of them and look what happened. If they have stopped holding church services on a Sunday, are they now holding them on a Saturday? According to the book Renegade Amish, they simply replaced church meetings altogether with meetings at Bishops Mullet’s home Sunday, Wednesday, and Friday nights. Donald Kraybill writes that “replacing regular worship services with three social meetings each week at the home of the bishop was unheard of in the Amish world,” and this “signaled a sharp break with Amish tradition” (p. 51).